Configuration management ensures informed business decisions and taking the right actions to make systems useful throughout their life cycles. In other words, we are talking about proactively tracking the versions and updates that are applied to the installed software packages, as well as the locations and network addresses of the hardware devices. So when a system needs a hardware or software upgrade, for example, the IT professionals can access the configuration management solution and the database to see what is currently installed. With this control, they can make a more assertive decision about the required updates. What configuration management is and what is it for? Traditionally, configuration management serves to ensure that technology tools are as they should be and are in compliance with the requirements. It also aims at the continuous verification that any change is properly evaluated, authorized and implemented. With configuration management, companies ensure they are making informed business decisions, performing the right actions and that all their systems are useful throughout their life cycles. And this is not an easy task! Many organizations deal with hundreds of thousands of requirements, documents, drawings, test plans, and so on. which are constantly changing. These items should be readily available, protected and kept correct at all times. With configuration management, you can ensure that nothing should be changed without proper review and authorization. In addition, you must design, produce, distribute, operate, maintain, upgrade and modernize hundreds to thousands of items, parts, assemblies, software programs, and so on. As we all know, DevOps is a software application development approach that prioritizes communication, collaboration, and integration between the developer team and IT operations. That is, a methodology that seeks to merge development and deployment into a simpler process, transferring part of the operations team’s responsibilities back to the development team. DevOps facilitates continuous development, integration, delivery and monitoring processes, breaking down the barriers between the two teams, making projects much faster and more efficient. In this way, when managing configuration within a project that is based on DevOps, the development manager is working to improve the whole process (from the creation of the lines of code to the implementation) in an optimized, simplified and efficient way. To this end, in addition to good practices, some tools are also used to accelerate the generation of infrastructure codes. These tools fill in the existing gaps and help lessen conflicts between developers and operations professionals. DevOps practices accelerate and streamline the configuration management process. That’s because when infrastructure is managed as code, multiple teams can collaborate and proven agile software development practices are brought to the level of IT operation: versioning, peer review, automated testing and continuous delivery. 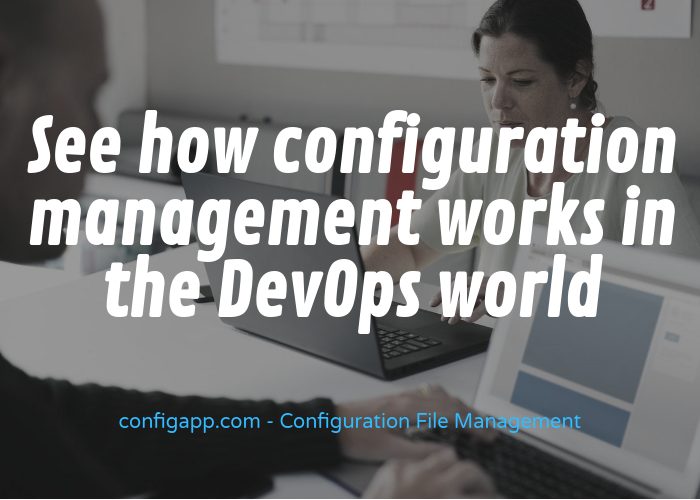 Automated configuration management is a key practice of successful teams that make use of the DevOps philosophy. That is, the infrastructures are managed as code, providing the basis for DevOps practices, such as version control, automated testing, and uninterrupted delivery. With this, you can confidently deploy changes and recover from failures faster, freeing teams to be more agile and responsive to business needs. A DevOps approach enables agility to deliver value to customers quickly. For this, audits need to be done more frequently and rigorously, and changes must be testable. It is also very important that teams (development and operations) become environmentally friendly with the DevOps philosophy. It represents a breakdown of paradigms not only for the manager, but also for all the professionals involved in the projects.